By the 1950s, air travel was tightening its grip on the American travel market. Airplanes offered cross country travel at an unprecedented speed with exceptional comfort. Railroads across the country began updating their fleets with new equipment in the hopes of enticing passengers to continue to travel by rail. The Santa Fe Railway Company was no exception. They wanted to find a way to compete with the comfort and views offered by airlines; thus, the Santa Fe El Capitan Hi-Level was born. A vintage promotional photo of the Hi-levels from the 1950s. The El Capitan was a luxury passenger streamliner that ran daily between Los Angeles and Chicago. It was operated by the Santa Fe Railway company between 1938-1971. In 1938, passengers could purchase a ticket from Los Angeles to Chicago for just $44.50! Santa Fe chose the name El Capitan to commemorate the Spanish conquistadors. Dining and Lounge Car seating aboard the Hi-levels. In the early 1950s the Budd Company presented Santa Fe Railway Company with designs for a luxury bilevel passenger car. Budd's design was inspired by two recent introductions to the railroad industry. 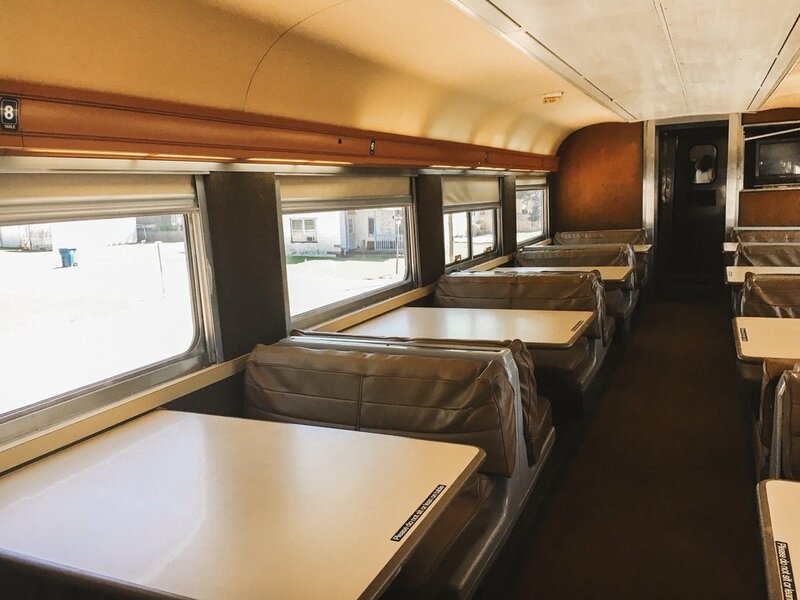 The first was the dome car, a passenger car with a glass dome on the top that had gained popularity in the intercity routes of the Western United States. The second was the bilevel car being used for commuters in the Chicago area. The first two Hi-Level cars entered El Capitan service in 1954 and were a smashing success; Santa Fe immediately ordered 47 more Hi-Levels to the tune of $13 million. Budd built 73 Hi-Level cars for Santa Fe between 1952-1964. The Hi-Levels were designed to give passengers a comfortable and luxurious trip comparable to that of air travel. The majority of seating was located in the upper level, allowing guests a quieter ride with much better views. Standing 15.5 feet tall, these cars were among the tallest and heaviest ever built at the time. The Nickel Plate Express travels over Morse Reservoir. Completely restored to their former glory, climb aboard our Hi-Levels this September and experience the railroad's answer to airplanes, just as passengers did in the 1950s! Peak out the huge windows and imagine yourself traveling cross country, speeding towards Los Angeles.